Kingsmill on the James, VA: Golf, dine and more. > Kingsmill on the James, Williamsburg VA presents its “Best Golf Package Ever,” offered again by popular demand. This package includes one round of golf on the River or Plantation Course per night of stay, accommodations for one night in a resort guest room, complimentary golf cart, range balls and club storage, full daily breakfast in Elements 1010, use of fitness room, indoor and outdoor pools, plus transportation around the property and to area attractions. Package price starts at $139/person based on double occupancy. Send me more information about Kingsmill! Sea Pines, SC: Come for top-ranking instruction. > Sea Pines Resort, Hilton Head Island SC is pleased to announce that Tim Cooke, Director of Instruction at The Golf Learning Center at The Sea Pines Resort, has been named to the list of Top 100 Teachers in America for 2019-2020. The biennial rankings are compiled by GOLF Magazine, which recognizes the most innovative, committed, and accomplished teachers in the country. It is the second consecutive year Cooke has been selected for the prestigious honor. Send me more information about Sea Pines! 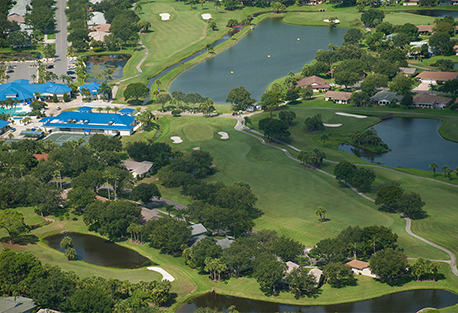 Indian River Colony Club, FL: Special golf program available. > Indian River Colony Club, Melbourne-Viera FL presents its “Go for the Green” golf welcome program for all home purchasers, especially beginning golfers. Access to the club’s championship course for the entire first year of residence is no charge. In addition, new arrivals are offered free golf lessons from the club professional to get them comfortable and competent out on the links. It’s an ideal way to swing into the lifestyle of Florida’s premier 55-plus community—773 homes on 453 verdant acres, including 23 lakes. Send me more information about Indian River Colony Club! Sea Pines, SC: Visit community for popular food and wine event. > Sea Pines Resort, Hilton Head Island SC has announced a Food Festival Villa Package for stays during the acclaimed Hilton Head Island Wine + Food Festival, happening March 7 -11. Stay in Harbour Town, just steps from the event sites, and enjoy great amenities and inclusions, among them a 10 percent discount off already reduced villa winter rates, 25 percent off tickets to the Wine + Food Festival public tasting on March 10, two hours of complimentary tennis per day at The Sea Pines Racquet Club and preferred rates at The Sea Pines Resort’s championship golf courses. Send me more information about Sea Pines! Come for surf-and-turf, oysters and more. > Osprey Cove, St. Mary’s GA has its romance-minded residents well covered for Valentine’s Day this year. A special candlelight dinner will be served on Thur., Feb. 14 from 6 to 8 pm in the dining room, with a prix fixe of $60 per person. It features a gourmet menu with everything from grilled Chesapeake oysters to a surf-and-turf entree and Chocolate Decadence Torte for dessert. 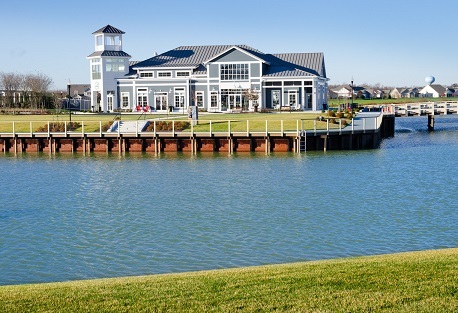 There will be a Dine & Drop on Valentine’s Day at the community’s River Club. Reservations needed for dinner and to reserve a child’s spot in the Dine & Drop. Send me more information about Osprey Cove! The Club at Ibis, FL: Honored for tennis amenities. > The Club at Ibis, West Palm Beach FL recently received high honors from an influential publication covering the tennis market. Tennis Industry Magazine recognized The Club at Ibis as a “Champion of Tennis,” and selected Ibis as the 2018 Tennis Facility of the Year in the private/commercial category. Send me more information about The Club at Ibis! 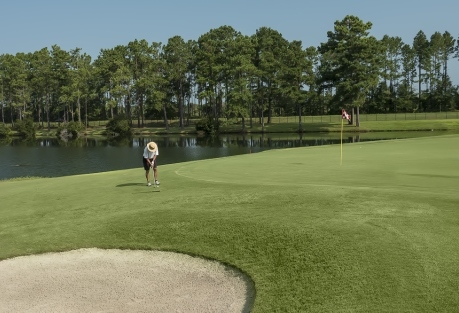 Kingsmill, VA: Special golf getaway package. > Kingsmill on the James, Williamsburg VA presents its Foursome Golf Package, specially designed as a two-night guys’ golf trip with condo accommodations. Starting at $315 per person per night, the package includes lodging in a 3BR condo, full breakfast at Elements 1010, unlimited golf on the River and Plantation golf courses, unlimited use of the driving range and club storage, free use of the Sports Facility and pools, and more. No additional resort fees apply. Send me more information about Kingsmill! Sea Pines, SC: Come to community for reception. > Sea Pines Resort, Hilton Head Island SC will hold a special reception as tennis legend Stan Smith signs his new book, “Stan Smith: Some People Think I’m a Shoe!” at a special wine and cheese event on Thur., Nov. 15, from 4 to 6 pm at Harbour Town Golf Links. The event is free and open to the public. Guests attending the event will have the opportunity to purchase Smith’s keepsake coffee table book for $55 plus tax. Proceeds from the event’s book sales will benefit the Hilton Head Island Boys & Girls Club. The book celebrates the cultural impact of the shoe, the best–selling sneaker in the adidas brand’s history. Send me more information about Sea Pines! Desert Mountain, AZ: Welcomes new golf director. > Desert Mountain, Scottsdale AZ is pleased to announce the appointment of John Lyberger as PGA director of golf. One of the most highly regarded golf professionals in the country, Lyberger had been vice president of club operations at Ocean Reef Club in Key Largo, Fla., and before that the 20-year director of golf at Congressional Country Club in Bethesda, Maryland. Lyberger will oversee a golf staff of 75 employees serving 1,900 members across six golf courses and pro shops. Send me more information about Desert Mountain! The Views Golf Club, AZ: Championship coming up. > Sun City Oro Valley, AZ and its Views Golf Club at Oro Valley will hold the Southern Arizona Team Championship November 17-18. Each 2-player teams get cart, green fee, range balls, prize fund and more. Send me more information about Sun City Oro Valley! The Landings, GA: Welcomes you to explore the island. > The Landings on Skidaway Island, GA presents an Island Discovery package for visitors wishing to experience the community’s enviable lifestyle. Package includes two nights’ lodging in a well-appointed island home, Guest Club Membership for the duration of your visit, one round of golf per person or a narrated boat tour for two around the island. You also get a full access to the 48,000-sf fitness/wellness facility, pools, tennis courts and four clubhouse restaurants, bicycles to explore the island and a personalized tour of The Landings. A four-day-stay option includes an extra round of golf or a Savannah adventure, plus more time to enjoy the island. Price for three days, two nights is only $249 per couple. Price for four days, three nights is $375 per couple. Send me more about this home in The Landings! Sea Pines Resort, SC: Impressive renovations in the works. > Sea Pines Resort, Hilton Head Island SC just announced the start of a $2.55 million fitness center renovation and expansion that will include the addition of a grab-and-go café, infrared saunas, state-of-the-art equipment and other amenities. The project includes addition of a second floor, tripling the size of the facility. The expanded fitness center will feature a new multi-purpose room for group classes and gatherings, and a café serving up healthy fare with expansive views of the club’s tennis courts and golf practice facility’s driving range. Send me more information about Sea Pines! Daniel Island. SC: Hosts music event. > Daniel Island, Charleston SC has a special musical event upcoming, the annual Homegrown Concert featuring Hootie and the Blowfish, with special guests The Blue Dogs. The performance takes place Fri., Aug. 10 from 7 to 10 p.m. at the Volvo Car Stadium on Daniel Island. Send me more information about Daniel Island! Calawassie Island, SC: A top course in SC. > Callawassie Island, SC has been named one of the top 50 courses in South Carolina by the South Carolina Golf Course Rating Panel. 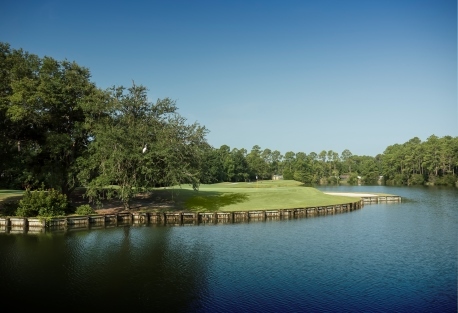 Callawassie Island Club was named to the list for the first time this year. The judging panel, composed of 125 golf enthusiasts from throughout the state, represents a diverse range of occupations, handicaps and backgrounds. The organization’s aim is to promote excellence in the state’s golf course design and operations through competitive rankings, education and public advocacy. Send me more information about Callawassie Island! Sea Pines, SC: Earns Golf Digest award. > Sea Pines Resort, Hilton Head Island SC has received an Editors’ Choice Award for “Best in Travel 2018” in the May issue of Golf Digest. The selection, through which the magazine’s editors identify its list of “The Best Things in Golf,” adds to the legacy of The Sea Pines Resort’s golf course collection and its premier luxury travel lifestyle. The awards list recognizes resorts throughout the United States, Mexico, Central America, the Caribbean, Bermuda, and Canada. Send me more information about Sea Pines! Heritage Shores, DE: Ideal for buyers 55 & up in a low-tax state. > Sun City Hilton Head – Riverbend, Bluffton, SC – Riverbend is an upscale waterfront community within Sun City Hilton Head Island devoted to residents 55 and up. A long list of amenities ranges from golf, tennis, swimming, fitness and pickleball to cultural events and avid-interest clubs. Real estate begins at $90,000. Send me more information about Sun City Hilton Head! 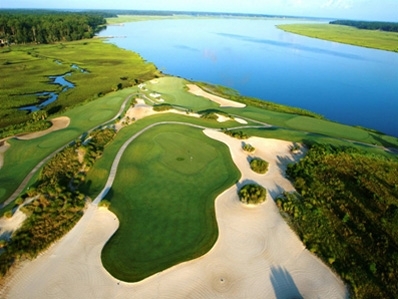 Colleton River Plantation, SC: Stay, golf & more. > Colleton River Plantation, Bluffton SC presents a Member Experience Package for visitors seeking a first-hand sense of daily life and recreation inside the community. The package includes accommodations for two nights in a Colleton River Cottage. Fun activities include a round of golf for two on the Jack Nicklaus course and also on the Pete Dye Course. 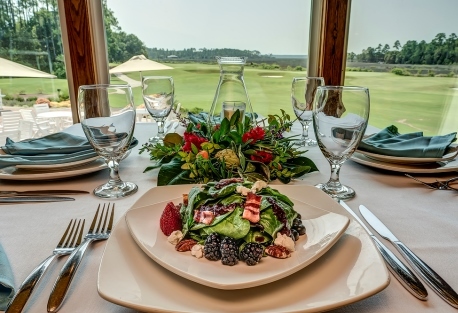 Have lunch each day at the Nicklaus Clubhouse, the Halfway Café or the Dye Clubhouse. Then enjoy unlimited use of the pool, tennis club, fitness facilities and the Borland Par-3 Course. Please inquire for rates when booking your visit. Send me more information about Colleton River! Sea Pines, SC: Inn earns a top spot in U.S. News list. > Sea Pines Resort, Hilton Head Island SC is pleased to announce that its signature lodging, The Inn & Club at Harbour Town, has been ranked among the top 50 hotels in the country by U.S. News & World Report, debuting at No. 14 on the list. The Inn & Club’s guests have easy access to stunning beaches, award-winning golf, an equestrian center, and more. This U.S. News list factors together each property’s star rating, industry accolades and guest reviews, and editor input. Of 2,194 properties considered for the 2018 list, the top 50 were cited. Send me more information about Sea Pines! Osprey Cove, GA: Custom club fittings twice this month. > Osprey Cove, St. Mary’s GA It’s club fittings days at Osprey Cove as its golf professionals welcome the gear experts from Callaway Golf and Cleveland Golf for two special custom-fitting events this month. On Sat., March 17 members will demo and be fit for the latest Cleveland wedges, down to proper loft and bounce angle. Then on Wednesday the 21st, Callaway Golf clubfitters will be on the Osprey Cove range fitting members to its well-received new Rogue wood line. Send me more information about Osprey Cove! Quail Ridge, FL: Preview many homes during tour. 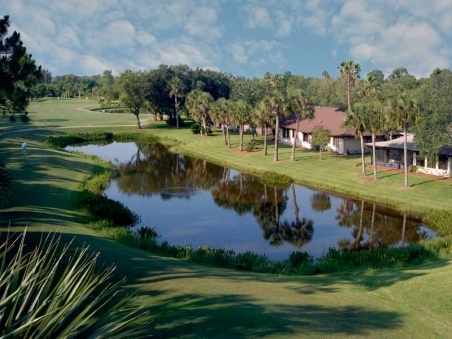 > Quail Ridge Golf & Country Club, FL is holding an open house tour Wednesday, March 14 from 10am to 12pm for an open house tour. Maps will be provided. The open house is a perfect way to preview different floor plans, and even check out the newly opened clubhouse. Send me more information about Quail Ridge! Sea Pines Resort, SC: Deals during food & wine fest. Stay in Harbour Town, just steps from the event sites, and enjoy great amenities and inclusions, among them a 10 percent discount off already reduced villa winter rates, 25 percent off tickets to the Wine + Food Festival public tasting on March 10, two hours of complimentary tennis per day at The Sea Pines Racquet Club and preferred golf rates at The Sea Pines Resort’s championship golf courses. Send me more information about Sea Pines! Sun City Oro Valley, AZ: Improve your skills during sessions. > Sun City Oro Valley, Oro Valley AZ just announced a slate of mid-week golf instruction for small groups. The programs happen on Wednesdays, from 10 to 11 a.m., featuring staff teaching professionals Tim Lochner and Kim Griggs. Feb. 7 covers putting, on Feb. 14 it’s a general short-game clinic, on the 21st it’s full iron shots and on Feb. 28 the topic is driving. New and casual golfers are encouraged to participate. Space is limited and the fee is just $20 per person for each session. Send me more information about Sun City Oro Valley! 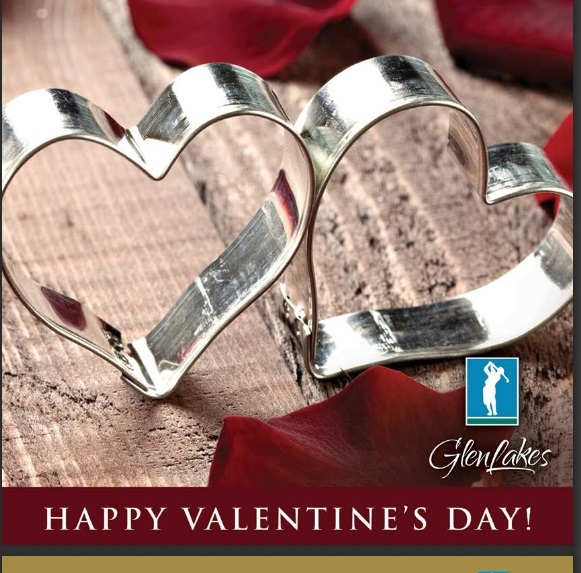 GlenLakes, FL: Celebrate Valentine’s Day with dinner, music. A full dinner menu with everything from oysters on the half shell to prime rib to an array of sweet desserts will be featured. Reservations are required for this event. Send me more information about GlenLakes! 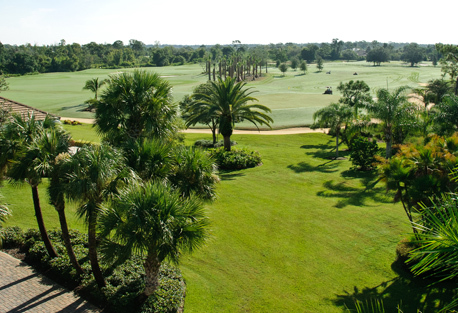 Indian River Colony Club, FL: Golf, dine & more during your stay. > Indian River Colony Club, Melbourne-Viera FL is offering a Getaway Package for only $99 per person, for 3 days/2 nights. The package includes lodging at a local hotel, a round of golf on the community’s championship course, tennis on Har-Tru courts, dinner in the At Ease Club with a resident couple and a private community tour with an IRCC realtor. Transportation is not included. Send me more information about Indian River Colony Club! Sea Pines, SC: Celebrating Pete Dye. 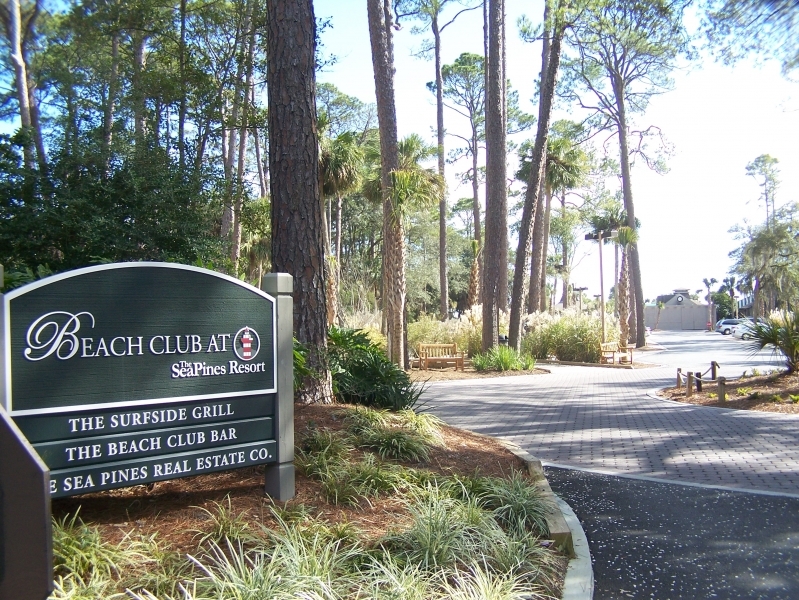 > Sea Pines Resort, Hilton Head Island SC has begun construction of its Pete Dye Room in the Harbour Town Clubhouse. Scheduled to open in February 2018, the multi-media exhibit will explore the close relationship between Dye’s career as the preeminent course designer of the modern era and rise to prominence of his celebrated creation, Harbour Town Golf Links. Two larger-scale elements will feature the machinery integral to playing his trade: a Smithco bunker rake for shaping golf greens and a life-size image of Dye using a transit, a surveying device. Dye’s numerous trophies and awards will be prominently displayed and will provide a testament to his place in golf and golf course design. Send me more information about Sea Pines! Viniterra, VA: Wear your sweaters for this event! > Viniterra, New Kent VA welcomes holiday revelers on Fri., Dec. 8 to the community’s on-property New Kent Winery for “Tacky Sweater Karaoke Night,” beginning at 6 p.m. Bring your holiday spirit for a fun night of karaoke and tacky Christmas sweaters. Buffalo Wild Wings will be on hand for the evening with a menu of hearty holiday fare. The Safe & Sound Family Truckster will also be on site from 5 pm to 9 pm collecting new toys and coats for families in need. Sea Pines Resort, SC: Snapshot of newly renovated club. > Sea Pines Resort, Hilton Head Island SC announced that Sea Pines Country Club (SPCC), the private club within the community, had opened its newly renovated Blue Heron Pub and Grille, offering members an exciting, casual dining experience to rival the island’s best restaurants. The 6,250-square-foot space features a modern design and expansive views of the tidal marsh. The expansion and renovation of the Blue Heron Pub and Grille is part of SPCC’s $2.7 million commitment to update the clubhouse. Send me more information about Sea Pines! Harbour Ridge, FL: After the seminar, take to the waters. > Harbour Ridge Yacht & Country Club presented by HR Properties, Stuart FL will host a monthly Fishing Seminar with Capt. Cameron from November thru May to discuss what kind of fishing is most likely to be hot that month, plus where to find that species and tips on hooking and landing it. This is an ideal way for residents to go after Cobia, Kingfish, Amberjack, Mahi-mahi, Snapper, Grouper and Sailfish, all of which are plentiful at various points in the season. Send me more information about Harbour Ridge!